Around the world: German economic growth fell to its lowest level in five years, matching diminished government expectations; China is expected to add further stimulus to its economy after rough December data; and it's Brexit voting day in the United Kingdom (expect results around 2-3pm Eastern). 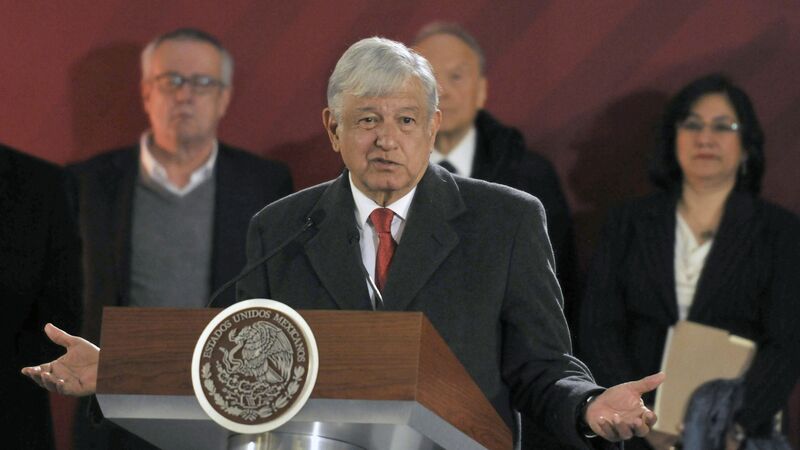 Barely a month into his term as Mexico's president, Andrés Manuel López Obrador is facing a swelling gasoline crisis — "one that threatens to cut into his popularity and worsen the nation’s already-sluggish economy," the Los Angeles Times writes. But even as the gas imbroglio rages, investors have been content to buy or hold Mexican assets. The nation's radical, far-left, self-described revolutionary president has their confidence. That was on display this week as Mexican stocks held steady and the peso rose in value against the dollar through the turbulent gas shortage. "Remember, there were people eight or nine months ago comparing AMLO to [former Venezuelan President Hugo] Chavez and that’s not at all what we have," said Cathy Hepworth co-head of emerging market debt at PGIM Fixed Income. "Nor is he …what we’ve had for the past 20 years in Mexico. And maybe at the end of the day some of what AMLO has in store for Mexico is what Mexico needs. You just have to be careful about how you go about making those changes." The big picture: Before taking office, AMLO scrapped a multi-billion dollar airport project and sent the Mexican peso and the country's stock market tumbling. That's why investors like Schroders' Barrineau and PGIM's Hepworth say they are maintaining a trust-but-verify attitude on Mexico. Still, since the release of his budget, which came in under cost expectations, Mexican assets have been on the rise. Be smart: The Mexican peso has been one of the top performing currencies in the world, and the Mexican stock market has outperformed the S&P 500 and an index that measures overall emerging market stocks since the budget's release. Economists have been wearing out their keyboards over the past couple of months writing down expectations for U.S. and global economic growth. But Alger chief investment officer Daniel Chung and director of strategy Brad Neuman point out that slower growth does not necessarily mean weak equity returns. "In the past 35 years, there have been 15 years when U.S. GDP growth materially slowed, with the vast majority generating positive U.S. stock returns." "Returns were negative only when accompanied by a recession (1990, 2000/2001, 2008)"
Reading the graph: Of the 15 times in the last 35 years that year-over-year GDP growth has fallen by at least 50 basis points, or 0.5%, the S&P has still risen in 11 of the 15 years. The gains have been as high as 38% in 1995 and 32% in 2013. Tyson Foods is feeling the pain from the trade war and a volatile agricultural market that’s seen meat prices crater, Axios' Courtenay Brown writes. "Suits are out," writes the Wall Street Journal's Elizabeth Winkler. "That is bad news for Tailored Brands, which owns the Men’s Wearhouse and Jos. A. Bank brands." The bottom line: The stock fell 36% in 2018 and looks set to fall even farther this year. The weak earnings and weaker guidance sent Tailored's stock down almost 18% Monday to its lowest since September 2017. Just as American workers are starting to see some real improvement in hourly pay, the fear is that — as central bankers traditionally do — the Fed will raise interest rates. That's because "wage growth" means inflation, according to economic orthodoxy, and inflation is the Fed's main enemy, Axios' Steve LeVine writes. But not this time: Leading economists tell Axios that, at least in part because inflation does not seem to be accelerating, the Fed appears prepared to let the wage party continue. "Powell seems to be adopting the 'whites of the eyes of inflation' position that I and many others have advocated for a long time," Larry Summers, who served in both the Clinton and Obama administrations, tells Axios. "No need to worry about apparently tight labor markets and wage increases until product price inflation is accelerating past 2%. We are not there." In a paper published today, 3 researchers at the San Francisco Fed said they do not expect "an abrupt jump in wage growth." Last summer, we reported a growing opinion among economists that the Fed should not apply the brakes to wages, but let workers catch up more. "Too often central bankers talk about any wage gains beyond productivity growth as immediately automatically inflationary — when they need not be," Adam Posen, president of the Peterson Institute of International Economics, tells Axios. "This is a welcome public recognition by the [Fed] leadership," Posen says. "Combined with their willingness to wait and see on inflation data, this could result in some real wage gains. And I think they're right to take that risk." Editor's note: A piece yesterday was corrected to show that the total percentage of Fortune 500 CEOs who are women of color is 0.2%, not 0.0%, and that Joey Wat is the CEO of Yum China. My bad, Joey.